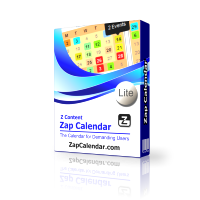 You can visit this link to read more about Zap Calendar Lite and also vote and/or review it. With the new year in full swing, we have released Zap Calendar 4.0.19, which contains enhancements and a new add-on (and bug fixes too). Our updates are based on feedback by our users, and we thank you for your continued support and feedback. If you have enabled Zap Calendar for iCalendar downloads, or if you are looking for a calendar to import into Zap Calendar, then this site may be for you. The iCalShare.com web site provides a directory of downloadable calendars. You can download any of the thousands of calendars available on the site and import them into Zap Calendar, or you can promote your own calendar by sharing it with others using this site. Zap Calendar has released its first language file for Zap Calendar 4. The Dutch language file is available for both the front-end and back-end of Zap Calendar, and can be downloaded from the subscription page. We are working on other translations, but we need your help. To help with a translation, go to the Zap Calendar page at transifex.com and sign up to be a translator. Translators can receive additional time to their Zap Calendar subscription for their efforts. Just as in the song, "Auld Lang Syne", our old friend Joomla! 2.5 retired at the end of 2014 with the final release 2.5.28. Our old friend has been replaced with a new friend, Joomla! version 3. Since this is the last expected release for Joomla! 2.5, current 2.5 sites should be migrated as soon as possible to Joomla! 3.x to avoid potential security issues in the future. If you are using Zap Calendar with a Joomla! 2.5 site, read this article on methods on migrating your Zap Calendar data to Joomla! 3.x. 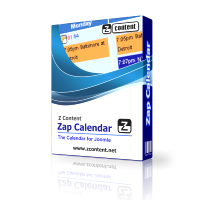 Zap Calendar 4 was developed for Joomla version 3.x exclusively and has been available for over 1 year. Nearly all of the 30+ add-ons that were available in Zap Calendar 3 are available in Zap Calendar 4, including a few new ones. This new version has incorporated many of the new features introduced in Joomla! 3.x, including GUI improvements utilizing jQuery, Bootstrap and icoMoon fonts. If you need to upgrade Zap Calendar and your subscription has expired, don't worry. You can renew your subscription at the renewal price by logging into your account at ZContent.net and clicking the renew or upgrade buttons on your subscription page. Click here for a comparison of the features of the 4 Zap Calendar versions, including Zap Calendar Lite. To download Zap Calendar Lite, login or create an account and navigate to the "My ZApps" page. Note: The support forum is not available to Zap Calendar Lite users. To use the support forum, you must have an active subscription to either the Basic, Standard or Pro versions of Zap Calendar. We have just released the second video in our Zap Calendar 101 series. This new video demonstrates the back end administration of Zap Calendar. If you are new to Zap Calendar or even if have used Zap Calendar for a while, you should learn something from this video. This video will also help those who are not yet Zap Calendar users but are thinking about using it in their projects. In case you missed it, our first Zap Calendar 101 video about the Google Maps plugin is available by clicking here. Zap Calendar 4.0.15 Has "Something For Everyone"
We have been working hard this past month and are very excited to tell you about our latest release of Zap Calendar. Version 4.0.15 has "something for everyone", including one or two cool items that we think will make you smile. Read on to see if we were right. Read more: Zap Calendar 4.0.15 Has "Something For Everyone"
The National Weather Service (NWS), the weather service used by Zap Weather, was severely impacted last week due to what appears to be a badly written Android app. Details on the name of the app and the exact cause have not been disclosed. Unlike this app, however, Zap Weather behaves nicely with the NWS by caching its weather data it receives from the NWS to minimize data loads between your Joomla site and the NWS. Our guess is that this app did not cache its data, causing a network load on the NWS servers as more people downloaded and used the app. You can read more about it in an article from mashable.com. Version 4.0.14 of Zap Calendar is the sixth release of Zap Calendar since we announced the first production release 3 months ago. There has been a flurry of activity in the past 3 months with new features, new add-ons and bug fixes. With several new add-ons released in this version, the number of add-ons in Zap Calendar's library has reached 30. You can see a listing of all add-ons on this page. If you have not updated your Zap Calendar site recently, now is a great time to do so. You can see a detailed history of what's new in the change log, or you can continue to read about Zap Calendar release highlights from the past 3 months.